Recently the Bureau of Labor Statistics (BLS) released inflation figures for February. Being a statistics geek, I immediately went to the source data and combed through the figures. 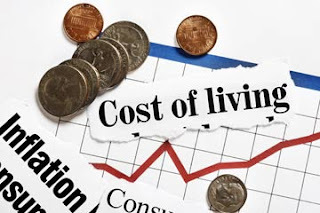 As I looked through the numbers, from the single reading of the Consumer Price Index (CPI), all the way through the individual price changes, I found myself wondering what it all means. I understand the data, and have analyzed it for almost two decades. But does this report give us any useful information at all? Or is it so divorced from reality that we should just junk the whole thing and start over? The more I dug into the numbers, the less useful they became. At first glance, it looked like prices were dropping. The headline number, which bundles everything together, was down 0.2% last month, and was up a meager 1.0% compared with last year. But economists, including Federal Reserve members, don’t look at the overall number. They strip out the volatile sectors of food and energy so they can focus on the “core” areas where people spend their money every month. While this is idiotic – since all of us must purchase food and energy to survive – and the price changes in those two categories are critical, let’s keep up the charade and look at other areas of note. If we didn’t eat anything in February, and didn’t drive (or turn on the electricity or heat), then inflation ticked up 0.3% last month, and was up 2.3% over February of last year. That’s a big difference! We went from severely undershooting the Fed’s target of 2%, to overshooting it. While energy prices are dragging inflation lower, the cost of shelter is pushing inflation higher. The cost of shelter was up 0.3% last month, and up 3.3% for the year. This category has an enormous effect on the inflation rate because it counts for 33% of all spending. And that’s where my problems start. Do Americans spend an average of 33% on shelter, both for their homes and vacation stays? That seems unlikely. The rule of thumb when getting a mortgage is that it shouldn’t be more than 30% of your income. It’s true that renters, especially those who are young with limited income, will often use more of their paycheck for rent, but approximately 64% of Americans own their homes, and only 75% of those have mortgages. If I conservatively estimate that all homeowners with a mortgage put 30% of their income toward shelter, that means the remaining renters must use an average of 51% of their income for shelter. Hmm. Other parts of the measure are even more suspect. College tuition reportedly rose by 3.2% last year, but don’t worry. According to the BLS, it only represents 1.8% of your budget. With two in college and one going in the fall, I take issue with this. As for those with little ones, the government shows that the cost of child care jumped 3.9%. But since it only takes up 0.742% of your budget, that’s no big deal, right? Obviously I’m poking fun at the way the BLS averages costs across the entire country. Not all of us have college kids or toddlers, but the costs associated with them are spread to all consumers, diluting the effects of price changes. But even when we get to items that are attributable to everyone, things seem out of whack. To analyze how prices change for the average Joe, I assumed a household with the median income that pays 10% in total taxes, which leaves about $48,000 in disposable income, or $4,000 per month. I then took the different categories from the CPI calculation and estimated by weighting how much Joe spends in each area. The CPI shows that Joe spends about $100 per month on car insurance, which increased 5.1% over last year. Clearly Joe is a fabulous driver with no tickets, low-value cars, and no young drivers in the house. But again, we’re averaging households with cars and those without. So let’s get to the one category that, by law, all of us must have – health care, which jumped by 3.9% over the last year. According to the CPI, Joe spends 6.06% of his budget on health care, including his monthly premium, doctor visits, dental care, vision care, hospital expenses (both inpatient and outpatient), etc. This includes everything but prescription drugs and medical devices. At that percentage, Joe coughs up (pun intended) $243 per month. Again, Joe must be the healthiest individual in America, and have no children, since that figure seems far removed from reality. Even when adding in those medical devices, health care only accounts for 6.82% of Joe’s budget. This seems remarkable, given that health care represents more than 18% of GDP. One area that has dropped in price dramatically over the years is information technology, which was down 8.3% last year. It would be great if the BLS used some of this cheap computing power to derive inflation figures much more tailored to how people actually live. They might consider breaking the figures down by age groups, showing how inflation affects young adults through education costs, young families as they buy homes, and older consumers when they use more health care. But I’m not holding my breath. Any analysis along these lines would immediately reveal an awkward truth. If the costs aren’t averaged across the entire spectrum, we have to confront the fact that groups like young families and retirees are getting crushed by rising prices.